Safety Harbor City Hall is located at 750 Main Street, Safety Harbor, FL 34695; phone: 727-724-1555. Photo: Ingleside (William B. F. Leech House), ca. 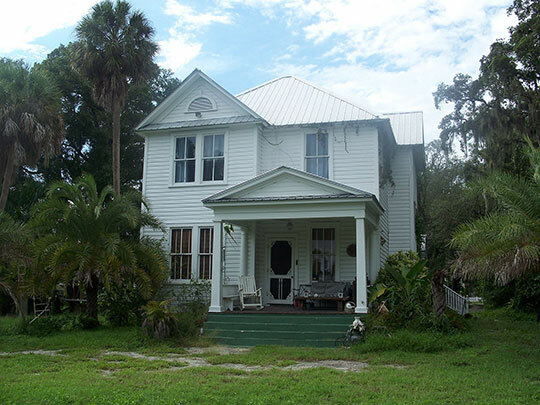 1889, 333 South Bayshore Boulevard, Safety Harbor, FL. Listed on the National Register of Historic Places in 1992. Photographed by User:Ebyabe (own work), 2007, [cc-by-2.5 (creativecommons.org/licenses/by/2.5/deed.en)], via Wikimedia Commons, accessed August, 2014. Safety Harbor, at the head of Old Tampa Bay, is built around a group of mineral springs known to the Indians, early Spanish explorers, and pirates. Narvaez marched into the territory after his landing at Boca Ciega Bay in 1529. The first known white man to take up residence in the vicinity was Odet Philippe, a surgeon in Napoleon's navy, who had been captured at the battle of Trafalgar in 1805 and transported to the Bahama Islands, where he was held prisoner for two years. Upon his release he joined the French Huguenot colony in Charleston, SC. There he married and resumed the practice of medicine. Leaving in 1819, he settled on the Indian River in Florida and began cultivating fruit. When sailing to the West Indies to secure citrus stock, according to papers in the possession of his descendants, he was halted and boarded by pirates who, disgruntled at finding no booty, threatened to scuttle his ship. Disclosure that Philippe was a doctor brought a welcome reaction, and he was taken on board the pirate vessel, "a dirty craft manned by a similar crew, where lay a sick, offensive old Spaniard." Later, both ships anchored in a near-by cove, and within a week the doctor had cured the sick man. So pleased was the old pirate that he presented Philippe with an iron chest filled with money, told him to be on his way, and assured him that in the future he would be "as free as a fish in these waters." Four years later Philippe abandoned his Indian River plantation because of a threatened Indian uprising. With his household goods, family, and slaves, he embarked on his schooner and sailed southward along the Florida Keys, where he again encountered the old pirate. When the doctor explained what had befallen him and expressed a desire to find a new home, the pirate displayed a chart and pointed out Espiritu Santo Bay, as De Soto had named Tampa Bay in 1539. There is but one other to compare to it — Naples, declared the pirate, who lyrically described the beauties of the place and the mineral springs at the head of the bay. Philippe sailed around the keys and up to the bluffs at the head of the bay. Here, in 1823, the doctor and his slaves cleared the land and established a new plantation. During the succeeding years he made many trips to Cuba and the Bahamas, bringing back citrus stock, guavas, and avocados. Some tobacco was grown, and the doctor taught his nurse to make cigars, a trade he had learned in France and the Bahamas. In 1839 he established a fishery to supply the garrison at Fort Brooke in Tampa. Settlers from many parts of the State came to obtain citrus plantings and to learn how to graft buds of the sweet orange on the sour orange tree that grew wild in the hammocks. In 1848 a hurricane swept away Philippe's home and slave quarters, and damaged his groves; most of his papers and records, including the pirate chest, were lost. Philippe died in 1869 at the age of 100, and was buried in the dense hammock that bears his name. Many Indian mounds at Safety Harbor were excavated by the Smithsonian Institution in 1930; the principal one in the group is a large mound with flat top and precipitous sides; 50 yards west is a small shell mound, 7 feet high; beyond is a low circular mound, 40 feet in diameter. The mounds contain both pre- and post-Columbian objects; shell and bone artifacts have been found deep in the mounds, and such articles as an iron axe and a silver tubular bead on the higher levels.